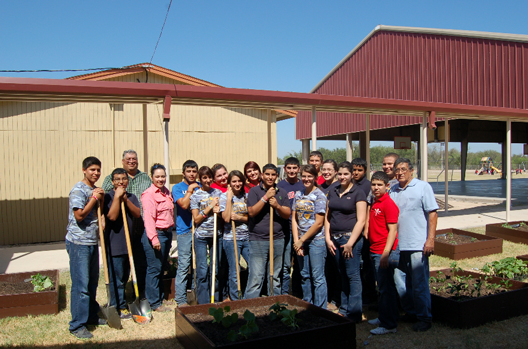 Sixteen Rio Grande City high agriculture students from Mrs. Randy Lara Martin’s class spent Wednesday morning along side other volunteers planting a garden at Dr. Mario Ramirez elementary. The experience reinforced the idea that community gardening is a successful and long lasting when the people affected by the garden have a role in leading the development of the garden. A total of fourteen community collaborators made contributions to the gardening project reports Yolanda Morado, Texas Agrilife Extension Service agent. Elementary students and parents worked along side of school staff members such as Sixto Flores Jr. and community volunteers like retired science teacher Mr. Ruben Lopez laying the foundation for the garden. Community gardens advance community organizing and development. These type of programs empower local leadership, nurture families, strengthen economic development, and improve quality of life overall. Serving as project coordinator was Rolando “Ronnie” Zamora Cooperative Extension Program Agriculture agent. Agriculture students experienced a different school day by serving as volunteers in a dynamic community building project..starting a garden.